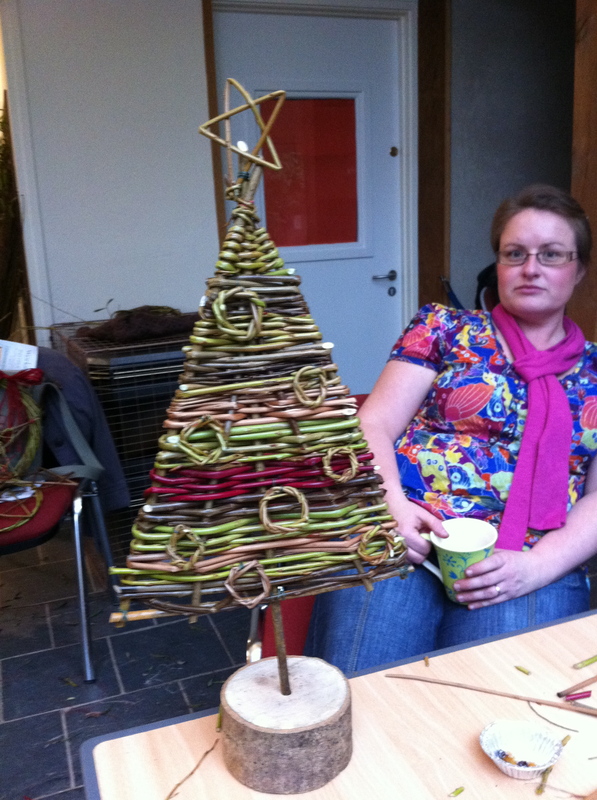 Last week saw the start of our Christmas decorations courses – five of them, all full! The teacher’s courses ran in the wonderful House for the Future at St Fagans. 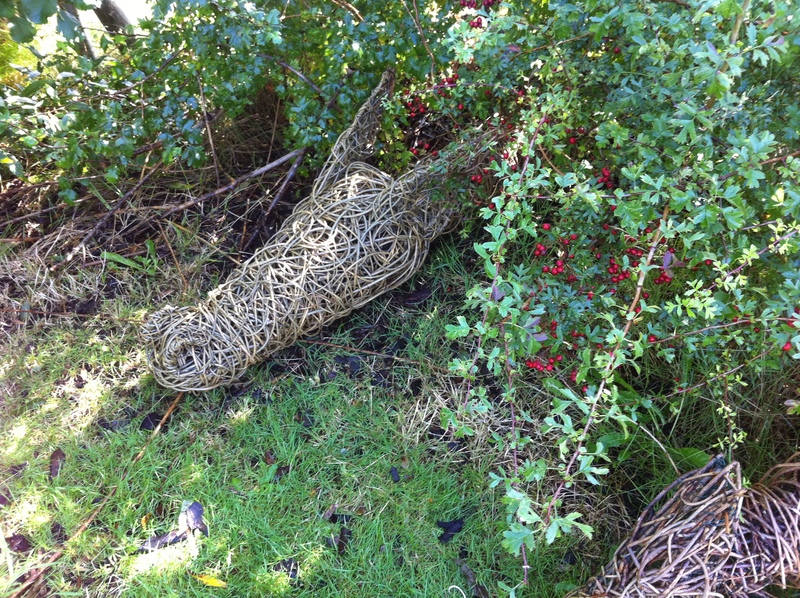 We had two lovely days working through our school progression which moves from oval festive birdfeeders, through colourful wreaths with freshly cut willow, to five pointed stars filled with random weave and fairy or angel wands for little ones or to go in flowers. 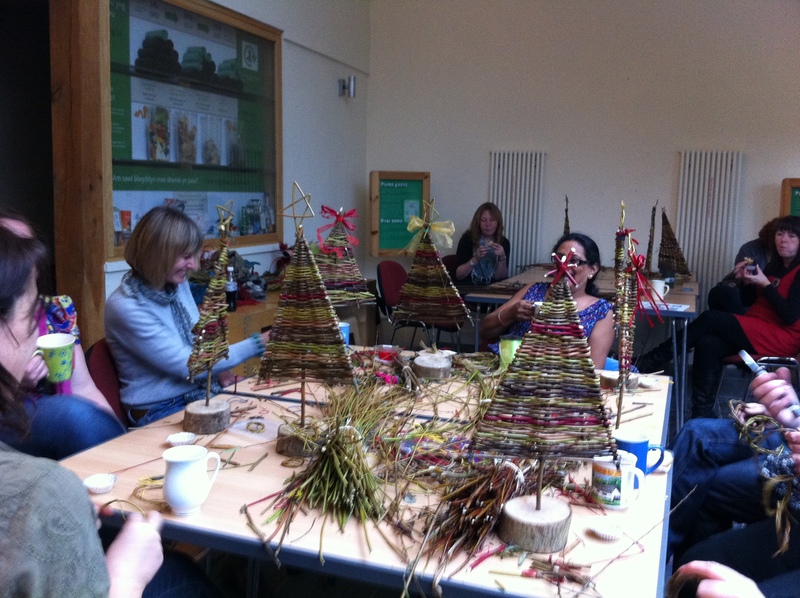 The afternoon focussed on a lovely tree for the classroom and allowed teachers to relax and focus on improving their weaving skills. As always we reflected on how little time we have as primary school teachers to work on our own skills before passing them onto the children. The day ended with weaving a little angel for the top of the tree complete with feather halo – aaaaaaaaaaaaaaaaaawwwwwwwwwwww! 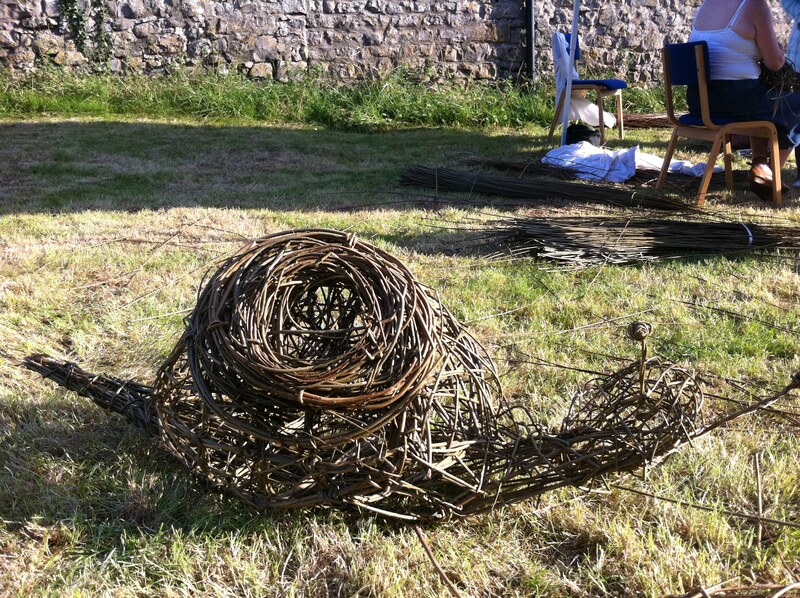 The teachers left with huge bundles of willow and armfuls of their wonderful creations fired up to pass on their new skills to their pupils. The only complaint – where is the mulled wine on teacher’s days?! Next year – we promise! The end of the week saw a course for the keen and talented parents at Rhigos Primary School, one of our favourite places on earth, a course at All Saints in Southerndown and finally another running at the Botanic Gardens. I moan like hell about the Christmas ads on the Telly in November but this is different, this is ‘real’ christmas – using the materials around us to start preparing for a natural and sustainable festive season. So five courses down – nine to go, and going to try so hard not to be Christmassed out by Christmas! 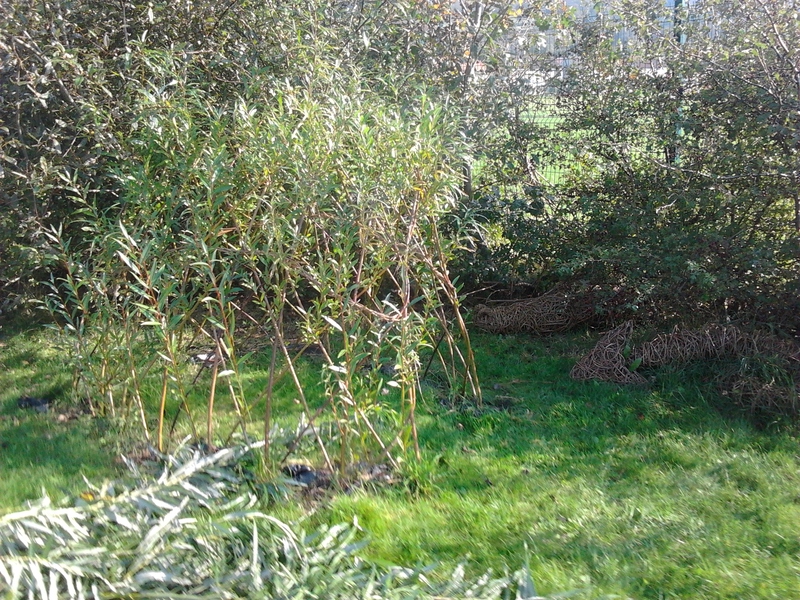 Our courses are now unfortunately full for this year, the living willow season has also started – why not put your name down for next year! 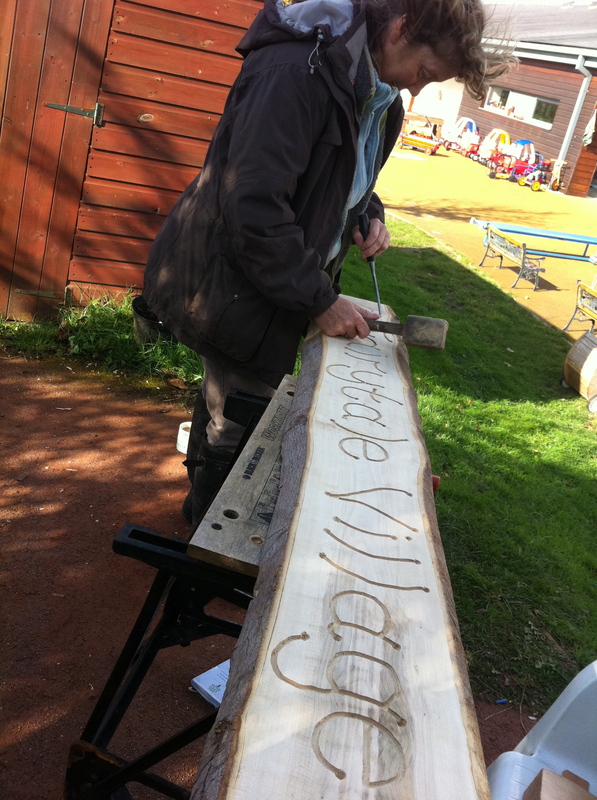 We had a fantastic two days at Rhydfelen Nursery finishing off the Fairytale Village with a carved wooden arch. 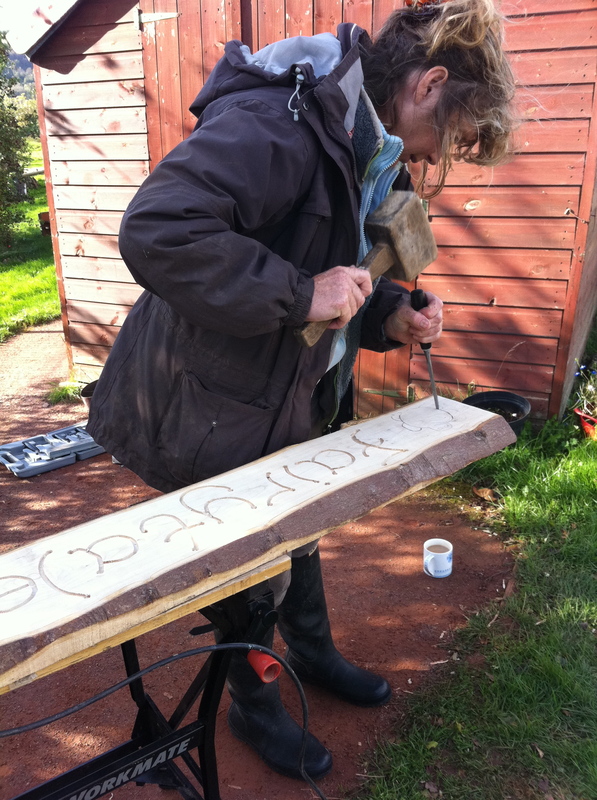 Although we have done a fair bit of green woodworking, use knives on a daily basis and had worked alongside another woodcarver we still felt we had a lot to learn when we embarked on this project. We needn’t have worried. 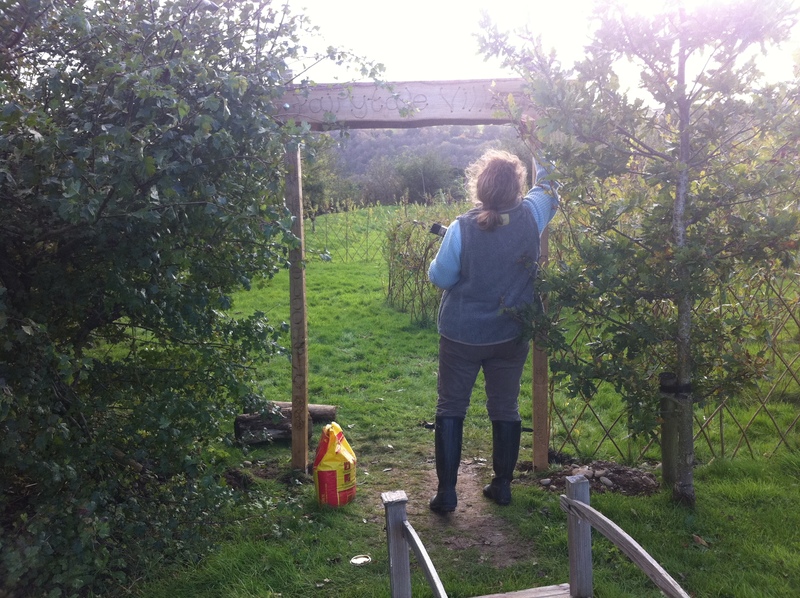 We spent two days working on carving and chiselling the children’s own drawings and impressions of their willow village (see previous blog entry) onto a lovely ash arch. This is still one of our favourite projects as everytime we visit we observe the incredible imaginative play that goes on. This time the whole group of ten children were whispering and tiptoeing around the structures so as not to wake the sleeping dragon in her lair. 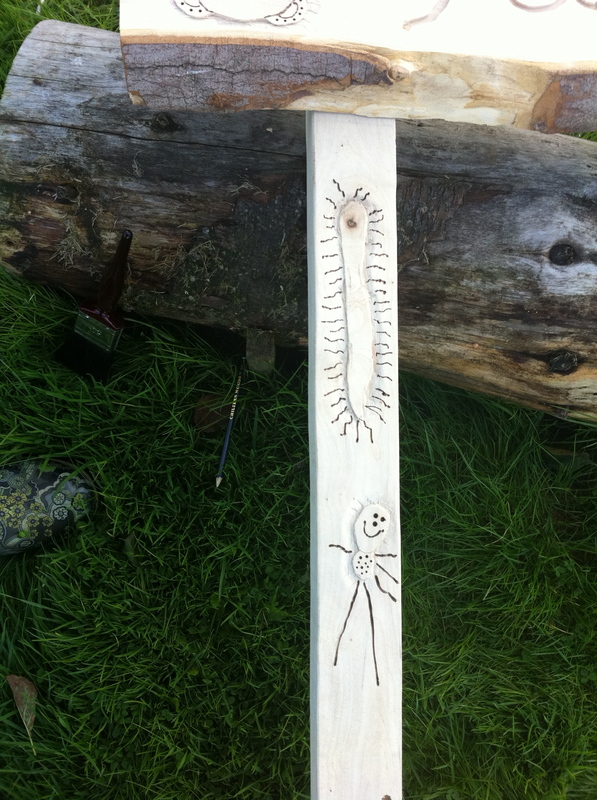 The staff also reported that a child who chooses not to speak at all in nursery came out of the willow village telling a story about the dragon – how fantastic is that! 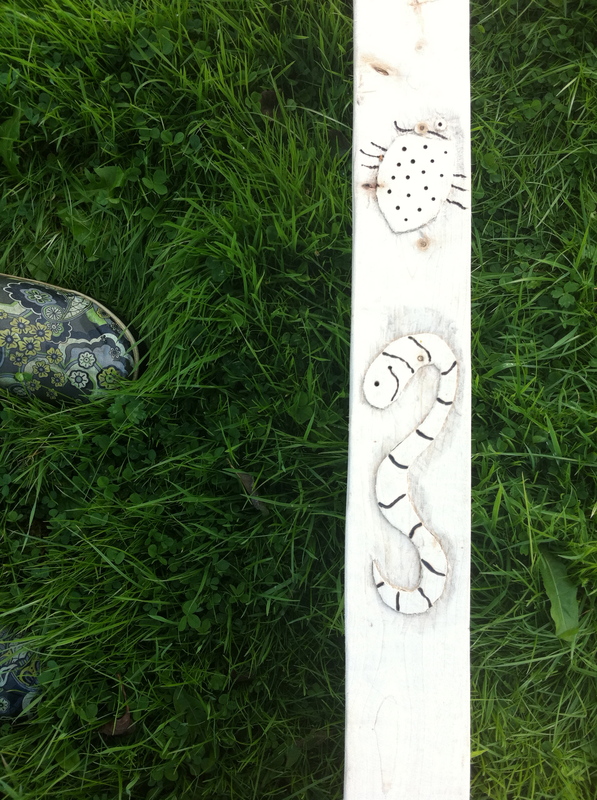 Coffins, cyntells and courses – time flies when you are having fun! September was very busy preparing for our first commercial coffin course to be taught by Roy Youdale from Bristol. 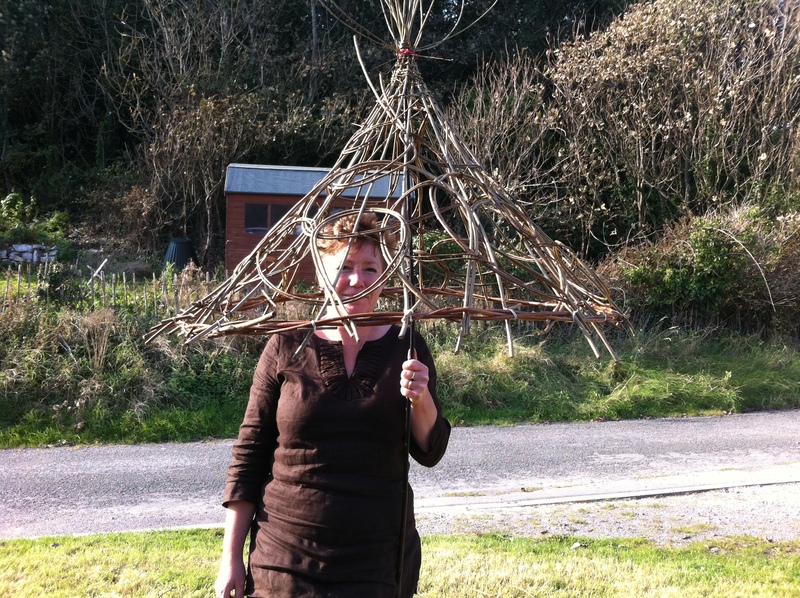 It had actually taken more than a year to prepare for this course as we worked on a design which would be suitable to be taught over the course of a week which would give advanced basketmaker’s a chance to improve their overall skills and produce something quite beautiful. We had a wonderful week with our course participants staying in a lovely local cottage with outstanding views of the cliffs of the beautiful Glamorgan Heritage Coast. 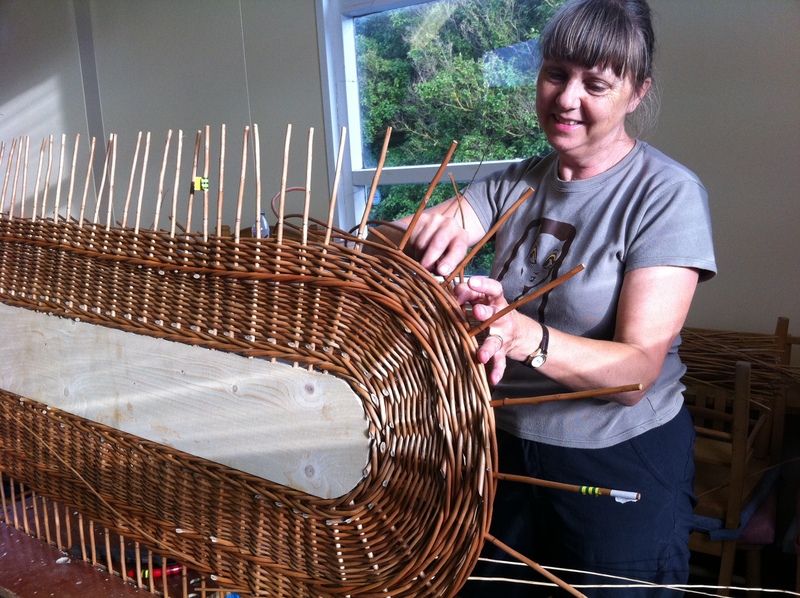 Reflecting on the progression of skills in basketmaking, most people start with a small round or frame basket worked with 4ft willow and then gradually build up over the months or years to working on larger more intricate projects with heavier willow. 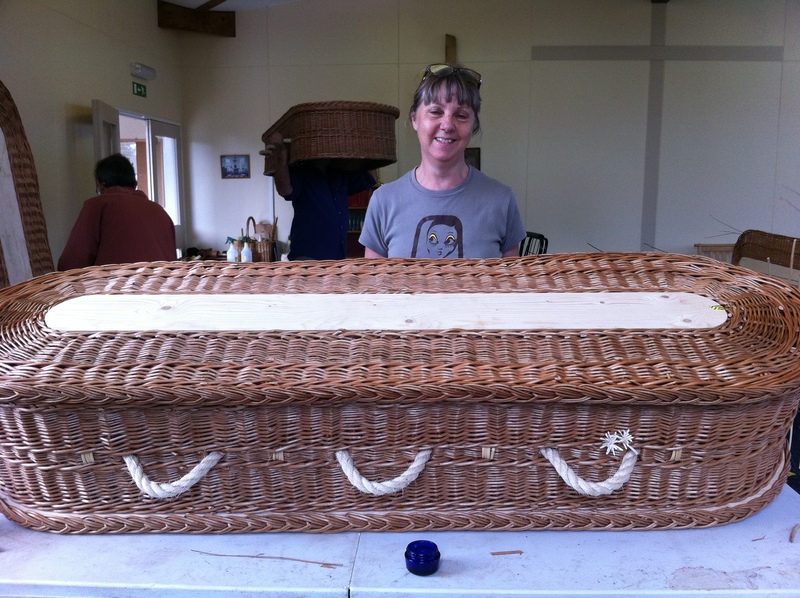 Our coffin course participants (all with a fair few baskets under their belts) worked with 6ft, 7ft and 8ft willow to produce intricate oval coffins with beautiful fastenings. 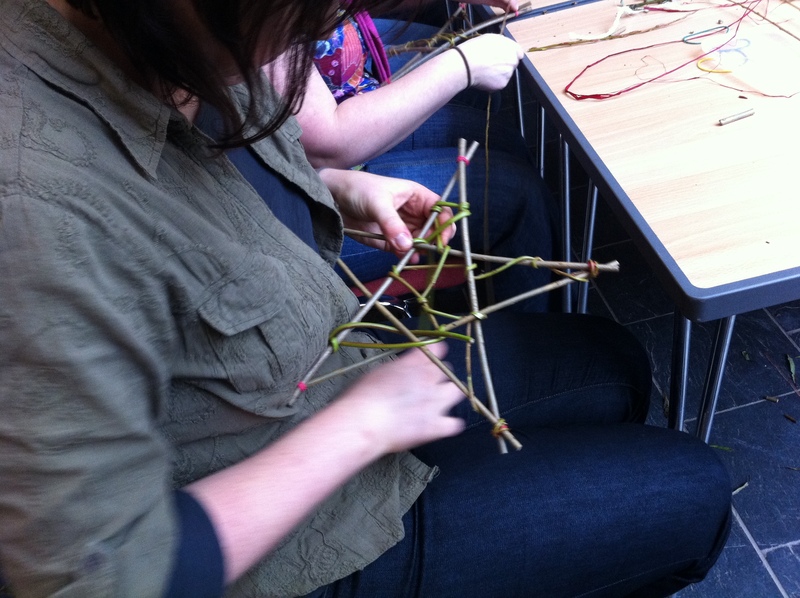 They learned and practiced a whole range of weaves including 4 rod wale, plait borders, french randing over a very large area, fixings and fastenings and how to keep weaving straight and even. 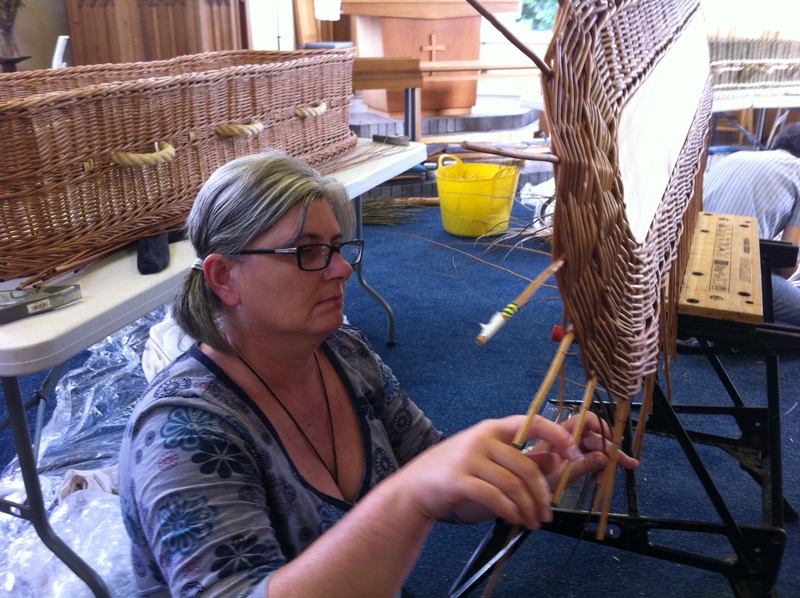 Working for five days solid is also a luxury for most people learning basketmaking these days and the sheer volume of weaving in a coffin allows you to get into a fluid repetitive rhythm and work on improving the evenness and neatness of your weaving. The finished coffins were , quite simply, works of art. Day two of our Cyntell course was a relaxing and enjoyable day with course participants travelling from as far as Oxford and Devon. The finished baskets were absolutely beautiful examples of traditional frame baskets which are made using the exact dimensions handed down from D J Davies to Les Llewelyn and Marvin Morgan. 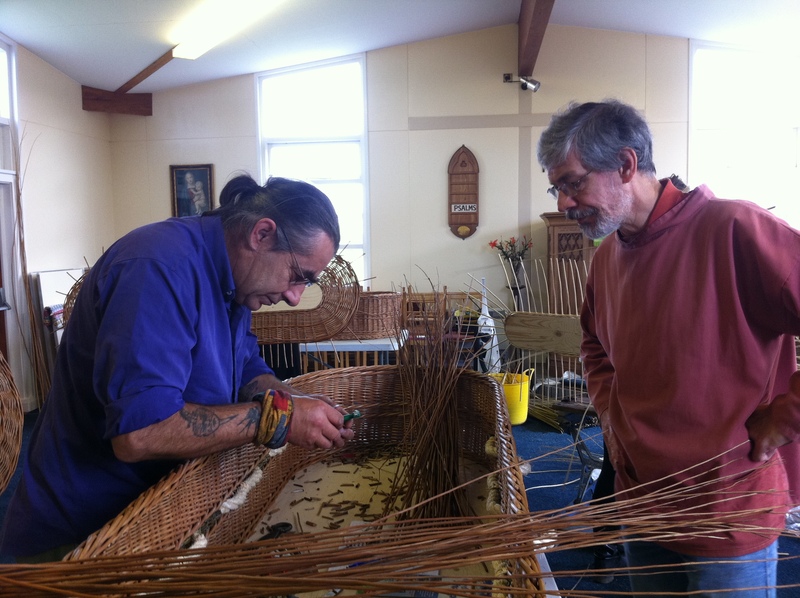 These two basketmakers are still making baskets for sale, Les also teaches from his home in Bridgend. Progressive 1 saw a day learning techniques of making bowl shaped round baskets – the challenge is always to make sure the weaving is rapped down well and the bowl shap is even all round. Some people learned how to weave a ‘German Wale’ which makes a lovely foot on the basket and gives an even join between the base and sides of the basket – as ever student’s found moving from sticky buff willow to waxy Dicky Meadows a big jump but a lovely selection of extremely different baskets were produced at the end of the day. Progressive 2 learned fitching to make a wine basket. 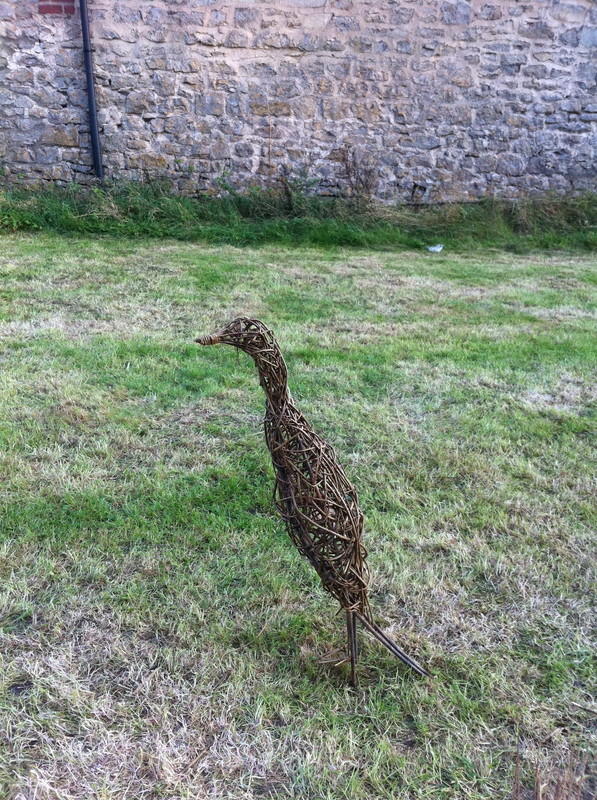 Sculpture has been very popular this year and the course at the end of the month was busy with eleven participants making a fantastic variety of bird sculptures. 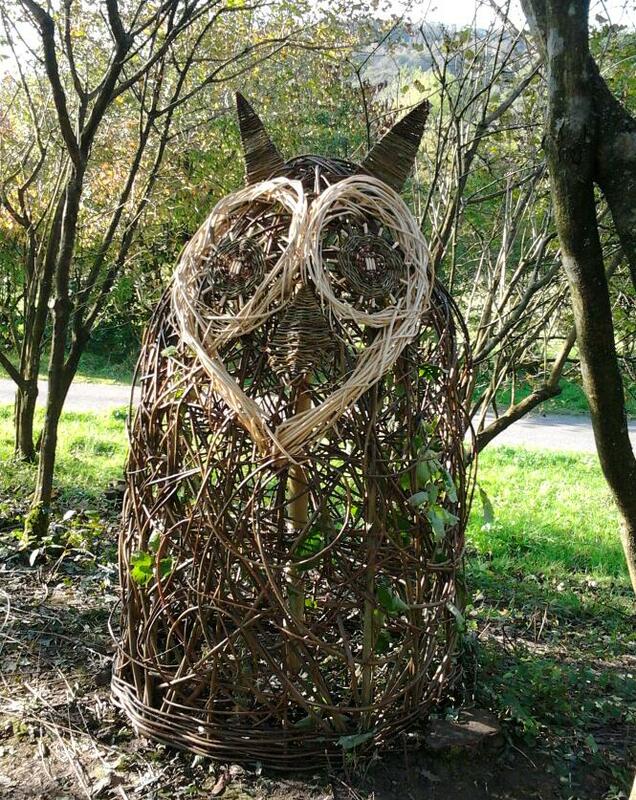 On the same day we were working with 25 people in Pontardawe to construct a sculpture of an owl in the Riverside park as well as a variety of smaller craft sculptures to take home. 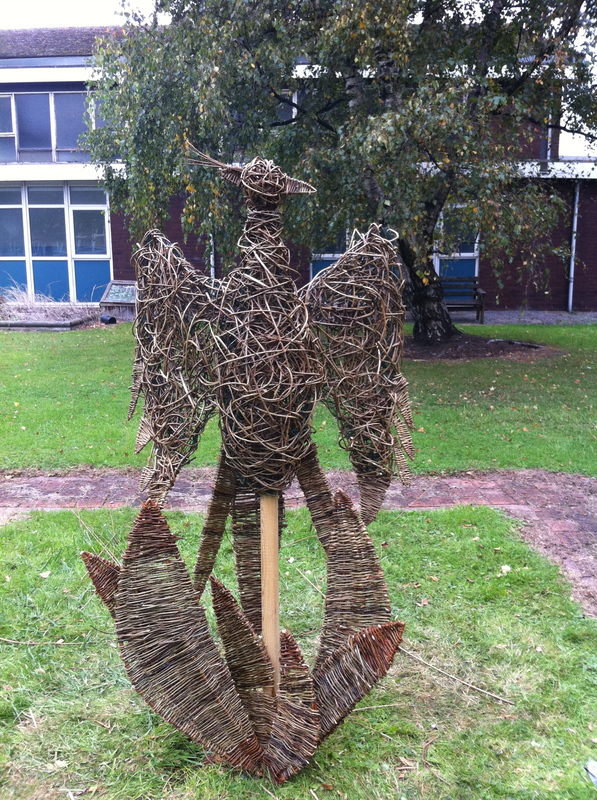 Other September projects included the sculpture of a phoenix in Willows High School in Cardiff, garden work including a woven rose arch, a Crown and Wand workshop for 90 Teddys and their mini owners at their Teddy Bear’s picnic – a fast and furious hour and a half – and a teacher’s Environmental Art course for Swansea and Neath Port Talbot where the favourite activity was – of course – willow weaving!